You need this item if you live in the United States (it won’t always work with international currency; instead you need to use magazine cuttings). It’s the strongest trick you can do: instantly change ones to hundreds. I bought it when it first came out, and it’s one of five tricks that I never leave home without, EVER. It has earned me plenty of new clients and shows. Sanders has compiled all sorts of new handlings and improvements, so I immediately ordered and am so glad I did. You will be too. The MOST VISUAL Bill Change system EVER...and now COMPLETELY EXAMINABLE! Extreme Burn is back WITH A VENGENCE! SUBTLETIES, PSYCHOLOGY and MUCH MORE! ALL the same incredible material from the ORIGINAL Extreme Burn DVD. ADVANCED UNDERGROUND CHANGES:?The Shake, The Snap, Cervon and more. PLUS: The Extreme Burn HOLDER?A thin wallet to hold your bills in. Richard Sanders has reinvented the multiple bill change. Working from the ground up he has transformed the visual impact of the effect and revolutionized the entire technique. 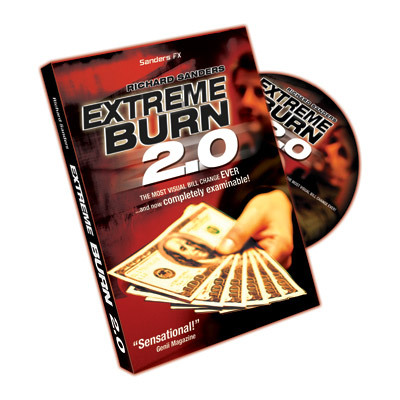 Extreme Burn is a devious recipe combining one part technique and one part gimmick that will allow you to VISUALLY change bills with no cover. The best part about Extreme Burn, besides the hyper visual changes is the fact that it is dead easy to do. The gimmick does most of the work for you so that you can concentrate on devastating your audiences. Extreme Burn is not just a variation; it is an evolutionary leap forward in technique and effect. Every word in the ad copy is true! This works, it's easy, easily reset, easy to handout and still reset, and most importantly LOOKS LIKE MAGIC!! !